I was exhausted after a long weekend of racing at the Rio Tinto Alcan Dragon Boat Festival. My team, Lifescan raced in the Competitive B final, 16th overall of 94 teams. All my energy was spent on the weekend and so when it came to thinking about dinner, I had to call on an easy solution for a Monday night. I had to go in to work on my Monday off so on my way home I stopped at Fujiya. I love Fujiya, and it was nice to see Mr. Fujiya as I call him, (his name is Hirai-san) in the store. I realized that I have been shopping at Fujiya for over 30 years. It’s my most comfortable grocery shopping destination and is conveniently located three blocks from where I work. I’ll have to post later about all that’s good about Fujiya. 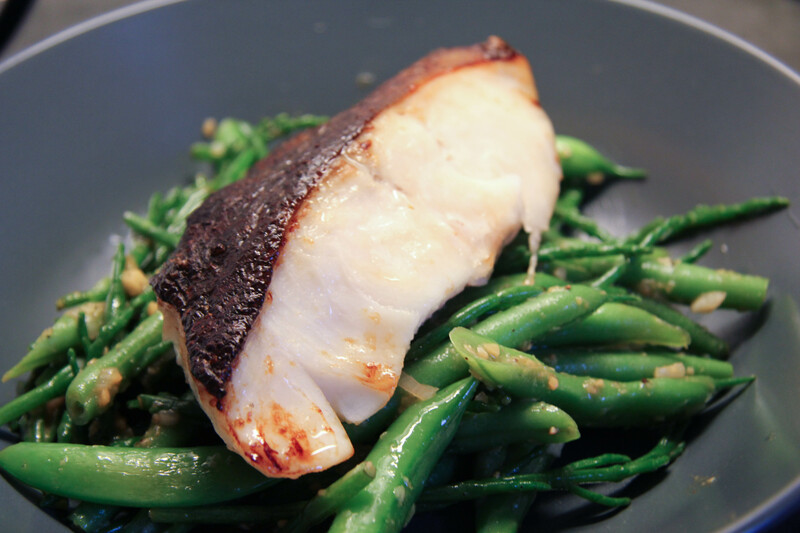 Today I knew what I was coming for, black cod, (aka sablefish) marinated in sake kasu. 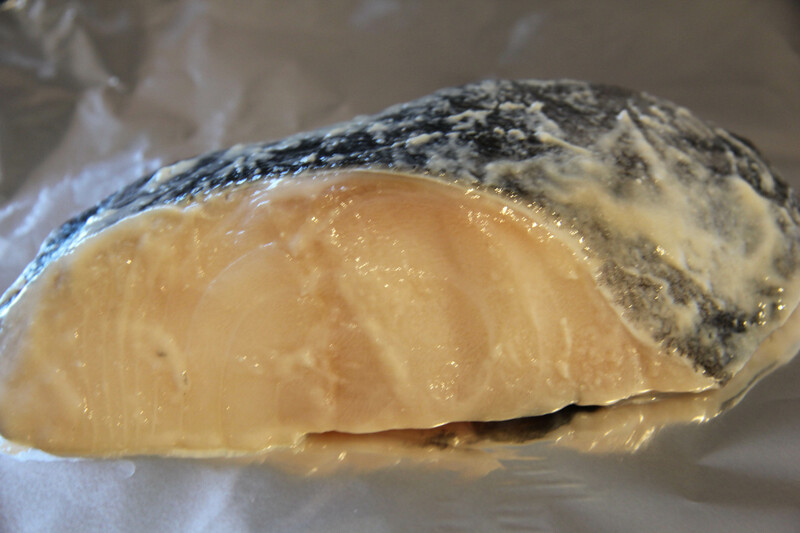 You may have eaten black cod in Japanese restaurants before and if you have, it’s generally marinated in sake kasu. If you don’t know, sake kasu is the lees left over when making sake. You can buy it as a paste at Fujiya and use it to marinate things yourself, but I don’t usually bother, because buying the black cod pre-done is just so darn easy. I know I posted a few days ago that I’m tired of ordering sablefish in restaurants, but I still can’t help but crave it now and then. Pre-marinated, baked in the oven @375* for 10-15 minutes, broiled until golden. My mother taught me well, so knowing that no meal is complete without vegetables, I wandered in the produce section looking for something to complement the meal. I found some green beans and snap peas. Something else caught my eye, sea asparagus. I’ve had sea asparagus before but never prepared it myself, so I figured I’d give it a try. 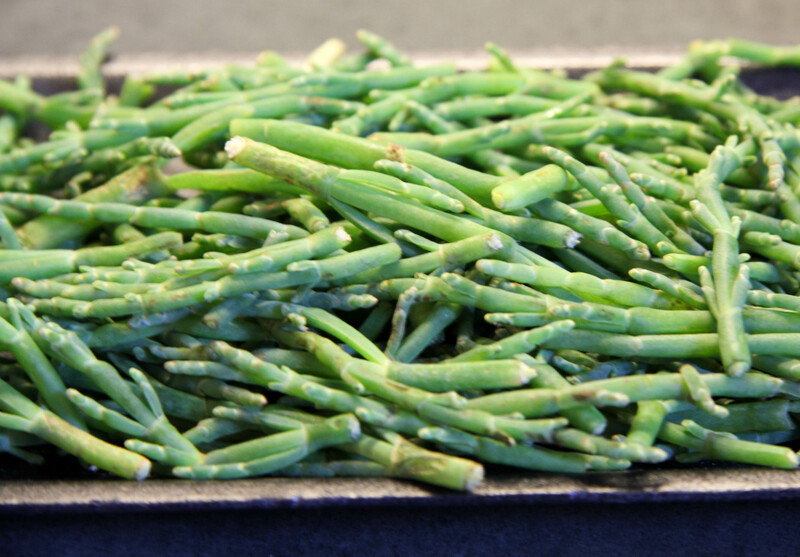 Sea asparagus, aka samphire, sea beans, salicorn or glasswort are packed with vitamins! What I didn’t realize is that you’re supposed to soak these wonderful greens in cold water for an hour to take out some of their saltiness. I tried another recommended method of boiling for 30 seconds and then putting them in an ice water bath. This seemed to cook them, but didn’t do much to take the saltiness out. I ended up adding them to my sauteed green beans and snap peas, dressed with miso, soy sauce, mirin and sesame oil and held back on any more salt to make up for their saltiness. All in, this dinner took less than 20 minutes to prepare. In the words of one of my former favorite chefs, “easy peasy”!